An innovative and fun way to learn. 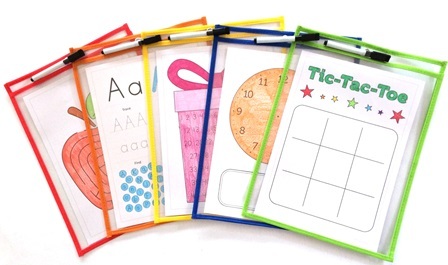 Simply insert A4 activity sheets into the pocket and write on this using a whiteboard marker. Can be reused over and over again. Includes whiteboard markers and activity sheets (also sold separately). TRANSPORTABLE for classroom, outdoor and home use. Available at OFFICEWORKS and leading educational suppliers.